Major Shrine: The shrine to Saint Helena in St. Peter's Basilica Patron of: archeologists, converts, difficult marriages, divorced people, empresses, Helena, the capital of Montana. Her princely munificence was such that, according to Eusebius, she assisted not only individuals but entire communities. The poor and destitute were the special objects of her charity. She visited the churches everywhere with pious zeal and made them rich donations. It was thus that, in fulfilment of the Saviour's precept, she brought forth abundant fruit in word and deed. 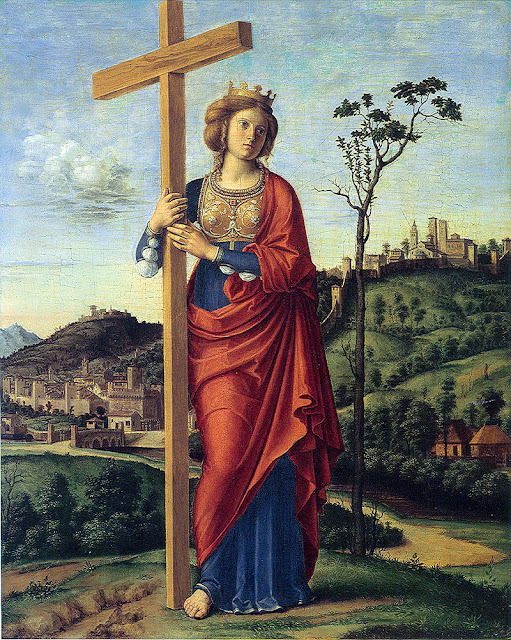 If Helena conducted herself in this manner while in the Holy Land, which is indeed testified to by Eusebius, Bishop of Caesarea in Palestine, we should not doubt that she manifested the same piety and benevolence in those other cities of the empire in which she resided after her conversion. Her memory in Rome is chiefly identified with the church of S. Croce in Gerusalemme. On the present location of this church formerly stood the Palatium Sessorianum, and near by were the Thermae Helenianae, which baths derived their name from the empress. Here two inscriptions were found composed in honour of Helena. The Sessorium, which was near the site of the Lateran, probably served as Helena's residence when she stayed in Rome; so that it is quite possible for a Christian basilica to have been erected on this spot by Constantine, at her suggestion and in honour of the true Cross. Helena was still living in the year 326, when Constantine ordered the execution of his son Crispus. When, according to Socrates' account (Church History I.17), the emperor in 327 improved Drepanum, his mother's native town, and decreed that it should be called Helenopolis, it is probable that the latter returned from Palestine to her son who was then residing in the Orient. Constantine was with her when she died, at the advanced age of eighty years or thereabouts (Eusebius, Life of Constantine III.46). This must have been about the year 330, for the last coins which are known to have been stamped with her name bore this date. Her body was brought to Constantinople and laid to rest in the imperial vault of the church of the Apostles. It is presumed that her remains were transferred in 849 to the Abbey of Hautvillers, in the French Archdiocese of Reims, as recorded by the monk Altmann in his "Translatio". She was revered as a saint, and the veneration spread, early in the ninth century, even to Western countries. Her feast falls on 18 August. and enjoy His Glory ever after.